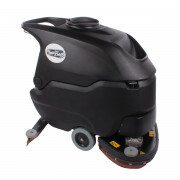 The Trusted Clean Dura 18HD automatic floor scrubber is extremely rugged and durable. It comes backed with a 5 year “No Questions Asked” warranty, meaning that no matter what happens to the machine, if something breaks or fails within 5 years, we'll ship you out a new replacement part at no charge with no questions asked. With an 82’ power cord and a pad/brush assist drive, you can run this machine four hours on end with little to no operator fatigue. 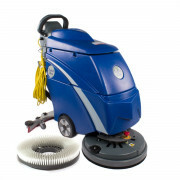 A great auto scrubber for small to medium sized businesses. Can clean up to 15,000 ft²/hr. 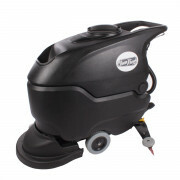 The CleanFreak® ‘Performer 20’ automatic floor scrubber blows the competition away when it comes 20 inch auto scrubbers. We have removed all the bells and whistles from this machine to keep it as simple as possible. This results in less maintenance over time and keeps your cost of ownership down. The control panel is extremely easy to understand, allowing a user to quickly jump behind the machine and clean a floor. Warranty plans are customizable for your specific needs. Comes with a pad, batteries & charger. This 24" walk behind scrubber comes with two 12" pad drivers (please see the warning below) and is an industrially rated machine that will cover wide areas in a small amount of time. Scrub pads and/or brushes need to be purchased separately depending on the type of floor you'll be cleaning. The 19 gallon solution tank ensures you will have plenty of solution to scrub the widest areas, and be able to continue without stopping to refill. This is the only 24" scrubber on the market that is a brush driven model. This package was built with end user in mind. 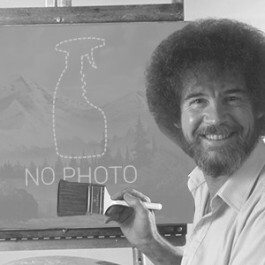 It contains everything you could possibly need to scrub any type of hard flooring. 2 different styles of pads, and 2 different styles of brushes are included to scrub smooth, as well as uneven floors. We also include defoamer for the recovery tank to protect your vacuums motors, and a super concentrated general cleaning solution for your floors. To make sure your machine is always recovering at 100%, the standard squeegee blades can be used on all 4 edges, but we also throw in a replacement set so your extended maintenance costs stay low.